This replica Sioux arrow is a copy of one in a set once owned by Red Rode Good, a Sioux warrior who was killed during the Sioux uprising of 1862. This arrow is made from a dogwood shoot and is tipped with a wicked barbed metal point secured with deer sinew. 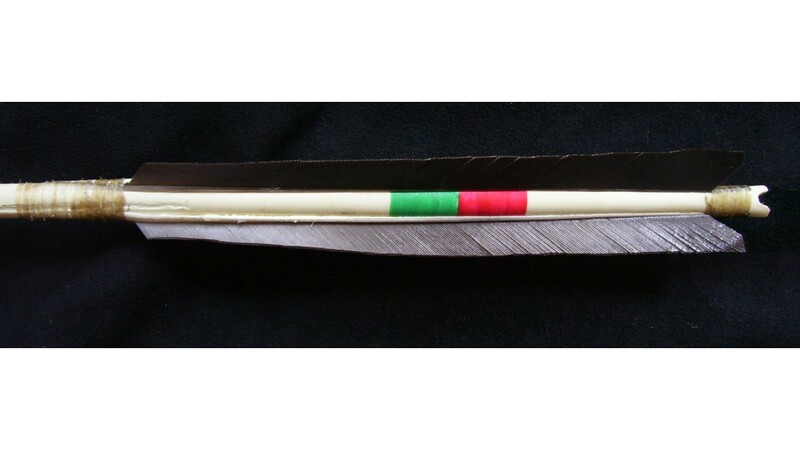 The fletch is Canada goose wing feathers secured with sinew and glued with hide glue. Canada goose feathers were used because they look identical to the dark brown eagle feathers that were on the original arrow. The paint design matches the original and is in the same location and is the same dimensions as the original. 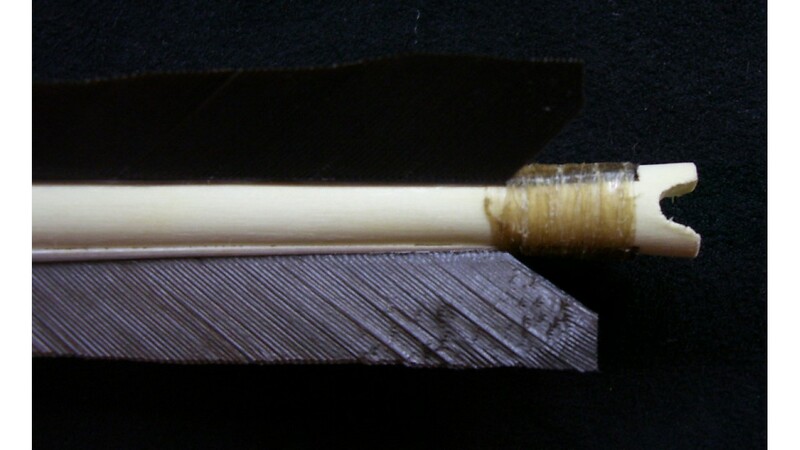 The shaft has three straight straightening grooves that run from the forward fletch sinew wraps and terminate at the point. The original arrow did not have the widely flared nock of other Sioux arrows I've examined, so this one follows suit. 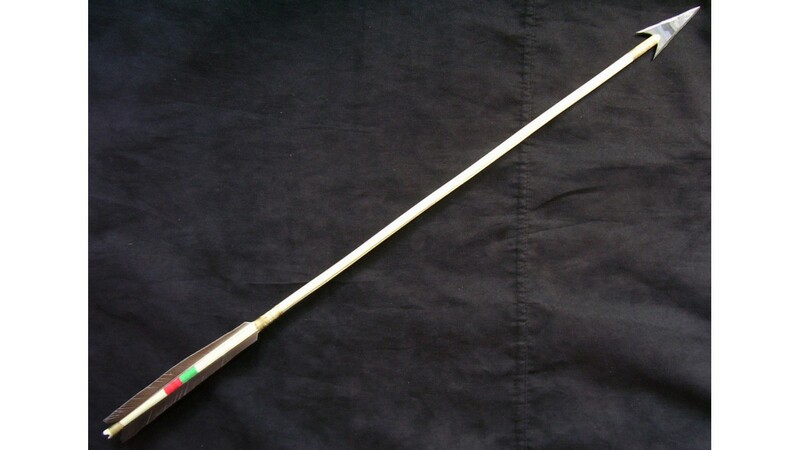 Imagine being shot with a barbed arrow like this one.... if it didn't kill you outright it would have to be surgically removed, otherwise it would remain in the body and probably result in a raging infection. I'm sure an untold number of victims faced this same grim scenario after an encounter with angry Sioux warriors. This arrow, as well as the entire set of archer gear is illustrated in The Encyclopedia of Native American Bows, Arrows & Quivers, Vol.1. 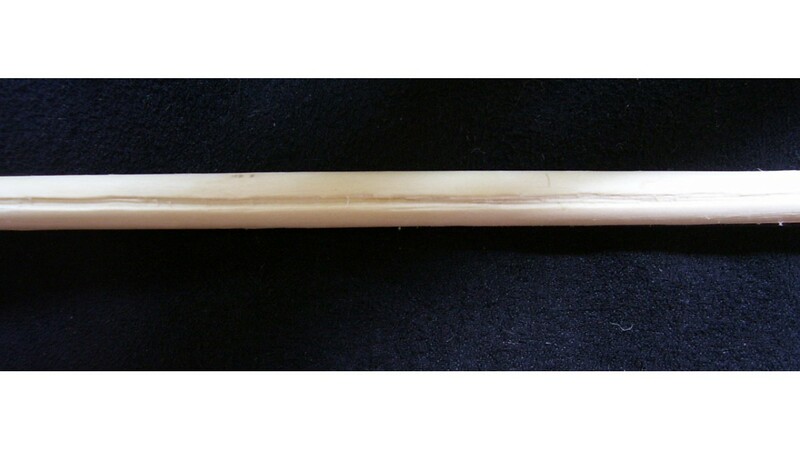 Arrow length: 24 1/2 inches.